Now of all the gin joints in all the towns in all the worlds and you decide to walk into mine. Yeah. That's right. I'm talking about to you Mark Waid, Javier Rodrigues, Alvaro Lopez, and Marvel Comics. But only in the month of August, 2014. I mean, couldn't you have gone to your local convent instead? To QUOTE Will Rogers: 'Diplomacy is the art of saying 'Nice doggie' until you can find a rock'. After a recent cosmic debacle, Matt Murdock suddenly comes to the realization that his father isn't the man he thought he once was. And so, to find out if this is true or not, he decides to go and visit his mother Maggie at her convent. However, Maggie isn't at her convent. She's been sent to prison for vandalism instead. What's more, due to red tape, Wakandan diplomacy, plus a secret in the making, Matt also finds himself left outside in the cold when he begins to investigate why. Whenever I hear that one of my favorite comic books is being thrown into some sort multi-part cross-over event, immediately my brain just winces because I dread what the final outcome would be. Well, let's face it. By in large these types of tales are wedged in, too contrived, or mealy there for the sake of being there. And normally I hate reading them for the exact same reason. Having said that though, no-no-no, not in this case, kiddo! 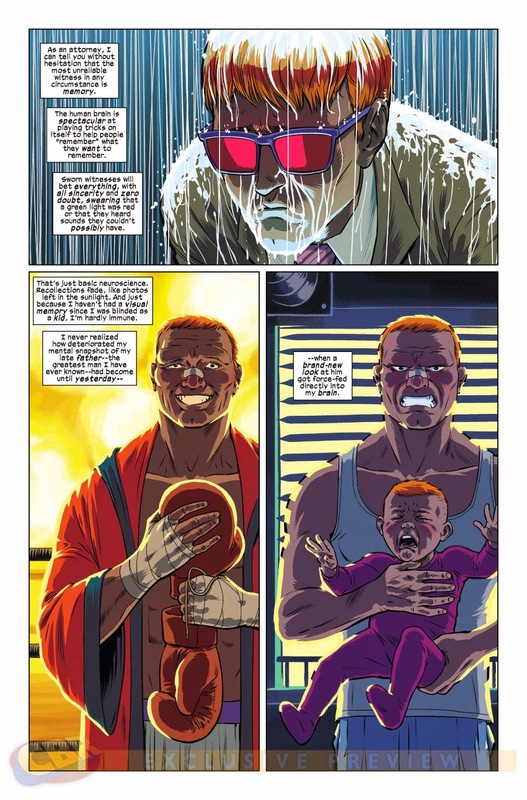 From my point of view this installment of Daredevil was f*cking marvelous to read. Not only was the artwork very well polished upon the page -- nice one, Alvaro -- but the story-line by Mark and Javier was one of the most engrossing, most personal, plus most exciting tales I've read in quite some time. I mean, what's not to like about following an adventure where the main hero wakes up one day to find out that his whole world has been turned upside down? And then, when he starts to patch things together, he finds out yet another dilemma that is just upon the horizon! To be absolutely honest with you, dear reader, I couldn't find anything at fault with this issue at all. OK. So maybe I could gripe about the artwork being tonally benign in places. Or maybe I could say how I wasn't too keen on Matt being slapped about by that Wakandan sod. But more or less everything in this issue -- and I do mean everything -- was really-really hunky-dory for yours truly. Bar none. Now for those of you who don't know Emily Bishop, let me just say she's a character in the longest running soap opera in recorded history, called 'Coronation Street', and that she's a fairly religious figure who was once arrested for protesting against something she didn't believe in. So can you see where I'm coming from with this, folks? In no uncertain terms this comic book equals Emily Bishop. Rock on!!!! In the last couple of pages of this book, we finally find out some of the real reasons why Maggie was thrown into the slammer by the Wakandian authorities. So, just for fun, let's see if you can guess what that real reason is? Go on. Give it a bash! At the bequest of Black Panthers fairly hot sister, whatever-her-name-is, Maggie has been deviously detained as a plot for her to get into Matt's pants. Whilst she was spraying her graffiti, Maggie accidentally spelt the word 'c*nt' incorrectly, and the Wakandian's are very hard-lined when it comes down to incorrect spelling. Without her truly even knowing, Maggie mistakenly came across some top secret shenanigans involving the Wakandian officials and their American counterparts. 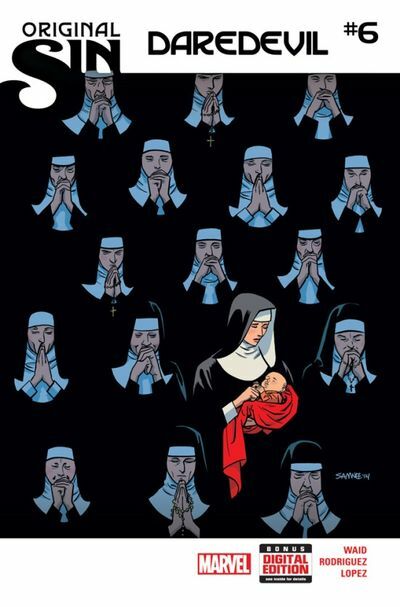 Despite being in a completely different comic book universe, the Joker wanted to know what would happen if you arrested a nun. For some unknown reason Wakandan men have a thing for elderly women with a hard on for God.